School workbooks are perfect for helping your child understand new information that he or she is learning in school. School workbooks come in a variety of forms. 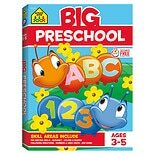 Preschool workbooks are great for children who are just entering school. These workbooks help children learn about colors, shapes, letters, numbers, and more. The exercises in preschool books help children prepare for kindergarten, so they are great for school preparation. The exercises in these books are created to be fun and entertaining, so your child will be excited to learn. Some activites in these books may include recognizing if items are the same or different, helping children understand directions, helping improve your child's thinking skills, and recognizing if an object belongs with a group. 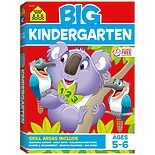 Kindergarten workbooks are great for children who have entered school. These books help children learn the alphabet, numbers, early mathematic concepts, early reading skills, and other important lessons. School workbooks can also be purchased for each year beyond kindergarten. School books may be focused on reading preparation, grammar, vocabularly, spelling, writing, and more when a child enters first grade, for example. Older children may study school workbooks that focus on advanced concepts like multiplication or division, complex sentence structure, fractions, adding, subtracting, science, history, and more. Each of the school books focuses on the knowledge that your child will need to have for each grade level in school.